The authors of Doing Justice to History: Transforming Black History in Secondary Schools will give a talk at 4 p.m., April 9, in the Prairie Room of the Bone Student Center. 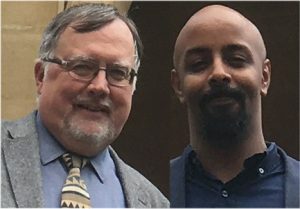 Robin Whitburn and Abdul Mohamud are the co-founders of Justice to History, an organization to help teachers and students explore relevant, and often neglected, diverse histories. They have been involved in developing and promoting school curricula on relevant themes for urban schools, particularly focused on stories of migration, empire, and identity. Their talk, Pugilists, Diggers and Choreographers: Activism and Educational Change in Urban Schools, is part of the Illinois State University Speaker Series and is free and open to the public. Mohamud is a senior teaching fellow at University College London – Institute of Education, tutoring trainee history teachers. He is a member of the UK Historical Association’s Secondary Committee, and has spoken at conferences in Washington, D.C.; Charleston, South Carolina; Murcia, Spain; Augsburg, Germany; and across England. Mohamud has 11 years’ experience of working with young people in urban schools and currently leads history curriculum development in an East London school. Whitburn is a lecturer in history education at the University College London – Institute of Education. He is a Quality Mark Assessor for the UK Historical Association, and has spoken at educational conferences in Beijing; Vancouver; Chicago; Durban, South Africa; and across England. Whitburn has 30 years’ experience in urban high schools. His doctoral thesis focused on the achievement of African-Caribbean males in high school.